Many of you know how I'm in Love with the Stampin'Up punches. Where some will you embellishments on their cards I enjoy designing with my punches in mind. Now that we have the Big Shot and all the different dies my card designs enjoy using both ideas. 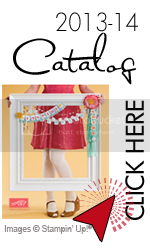 We have an exclusive die called Join in the Cheer Decorative Strip Die. 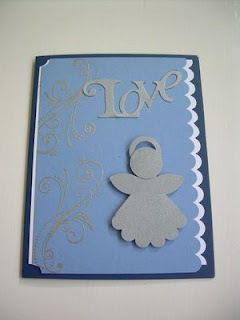 I've cut out the word " LOVE" from the strip of words for this card along with the four punches required to make my angel. This month Stampin'up is offering 20% off of the stamp sets in the Catalog Sampler that was mailed you you back in August. If you love butterflies there is a great stamp set called Flight of the Butterfly at 20% off the 31.95 for 10 stamps. Take a look and maybe have someone give you a stamp set as a stocking stuffer. Next week on December 9Th I will be getting the retired stamp set list. I will be forwarding it to you if you are on my email list. These stamp sets will be gone forever. Don't miss taking a look at the list and compare it to your Wish List. You can contact me or go to my SU website and order yourself.